The U.N. sanctions monitors determined the current terms of the U.N. arms embargo do not allow for such activities and recommended that the Security Council provide advice to U.N. states on compliance with the embargo. The UAE has also trained 4,000 Yemeni fighters in Assab, Eritrea. The U.N. sanctions on Eritrea were mainly imposed following accusations it backed Somalia’s Islamist al Shabaab militants, a charge Asmara denies. The U.N. monitors said in the latest report that they had, for the third year in a row, not found any firm evidence of such support. 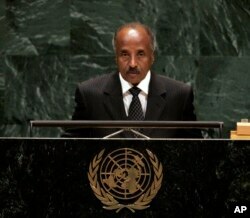 Eritrea has refused to engage with the U.N. monitors, and they have been unable to visit the country.